North America Forum»Forum ›Knights Fable ›General Discussion › New Titles? been wondering when will this be implemented on our server? because earlier i already saw someone using the title. Why it still cannot be use yet though I\'m in Top 5 of BR rank? It is for when you first start now. ;If you are top 5 in BR after the 7 days you get that. ;;;; It is for when you first start now. ;If you are top 5 in BR after the 7 days you get that. when did it start btw? Only newbie servers can get the BR title. 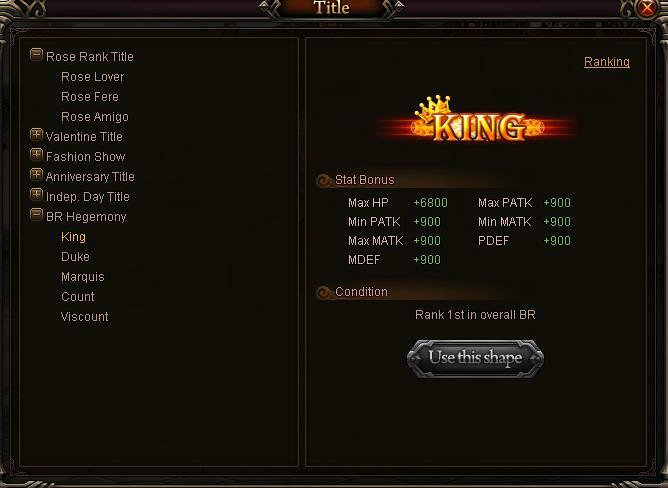 ;;;; Only newbie servers can get the BR title. Completely unfair, I want my King title. 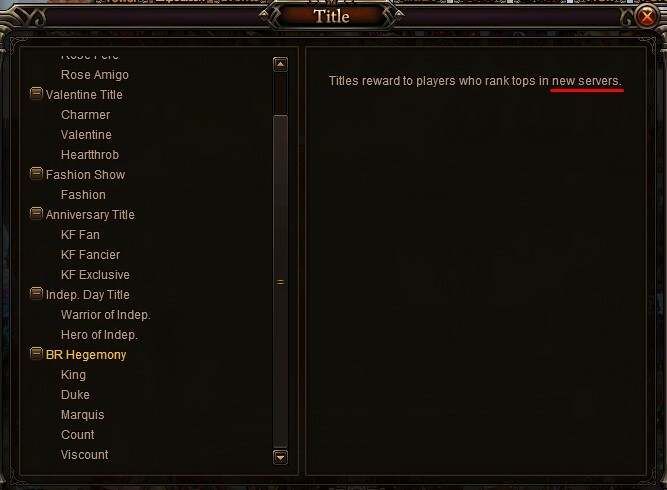 Why only newbies can have those titles?? What\'s a King? I never even saw a Duke, and the Aristocracy mentions nothing of a King at all. And they definitely don\'t have a spot on the Aristocracy for players to see, so how do we know who\'s who? 2019-4-22 20:46 GMT+8 , Processed in 0.062748 second(s), 52 queries .